Is it rock? Is it kuduro? No, it’s Rockuduro! A full-on mash-up multiple-party full-speed collision perpetrated by a conspiracy hatched somewhere between Angola and Portugal. 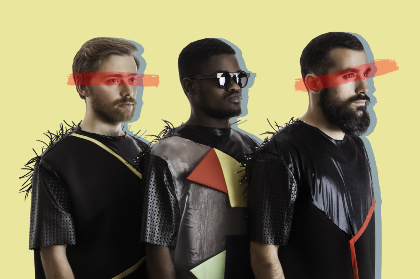 The plotters are rock/electronica guitar/keyboard boffin Marco Castro and drum thrasher Igor Domingues from Porto – hereafter known as Throes – and explosive vocalists Diron and Mob Dedaldino from Luanda – hereafter known as The Shine. Since forming in 2011 they’ve released three albums and pumped-up audiences across Europe including memorable performances at Roskilde, Lowlands, Rock En Seine festivals. 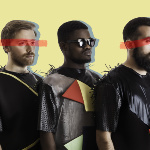 Their new album Wanga features guest appearances from such global notables as Canadian-Congolese multilingual rapper Pierre Kwenders, Argentina’s La Yegros, Da Chick, and Colombian group Meridian Brothers. Wanga means ‘spell’ in the Angolan dialect of Kimbundo. Throes + The Shine intend to put you under one.